Explore how an unlikely friendship between community leaders of differing faiths, races, gender, and national origins has led to increased acceptance and support, and how we can engage in our own community to foster encouragement, understanding, and empathy. "Understanding Diversity Through Faith: An Evening with Faith Leaders for the UTA Community" brings together Imam Omar Suleiman of the Yaqeen Institute for Islamic Research in Irving, the Rev. Michael Waters of Joy Tabernacle African Methodist Episcopal (AME) Church in Dallas, and Rabbi Elana Zelony of Congregation Beth Torah in Richardson for this open discussion. UTA, in partnership with Faith Forward Dallas at Thanks-Giving Square, hosts the free event at 6-7:30 p.m. today, Tuesday, March 28, in the Rosebud Theatre of the E.H. Hereford University Center. LEARN MORE. UTA's Quality Enhancement Plan (QEP) will provide all undergraduate students with a competitive edge through participation in the Five Distinguishing Activities. Students will be encouraged to take part in at least three of the five activities, which are leadership, undergraduate research, global engagement, community engagement, and career preparedness. Learn more about the QEP at uta.edu/qep. The QEP is one item to be reviewed when eight external reviewers from the Southern Association of Colleges and Schools Commission on Colleges (SACSCOC) visit UTA Tuesday-Thursday, April 4-6, for the University's reaccreditation. LEARN MORE. 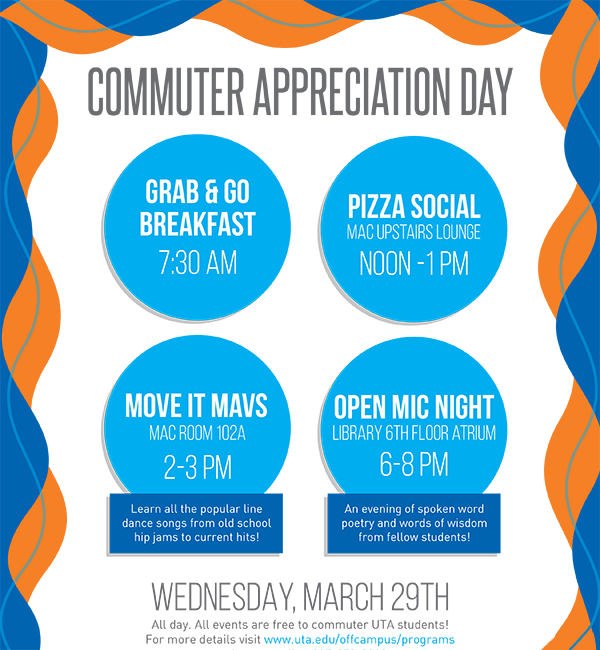 UTA's day of community service, The Big Event, still has openings for volunteers. See the project list at uta.edu/thebigevent and register by Friday, March 31. The Big Event is 9 a.m.-1 p.m. Saturday, April 8. 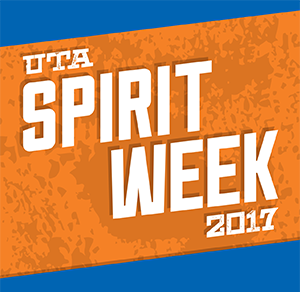 Show your school pride and test your knowledge of UTA history and traditions during Spirit Week. Teams receive points for events and then prizes for the points. Events include Trivia Night tonight, Tuesday, March 28; UTA vs. North Texas softball game Wednesday, March 29; a food drive Thursday, March 30; and a pep rally Friday, March 31. LEARN MORE. Graduation candidates have until Friday, March 31, to purchase tickets to participate in the Black Graduation Ceremony and be included in the program booklet. 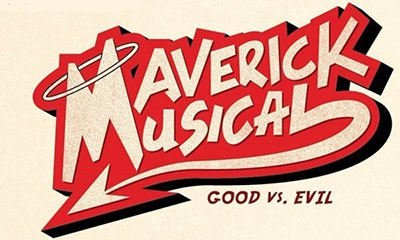 The event is 3-5 p.m. Saturday, April 22, at the Lone Star Auditorium in the Maverick Activities Center. Submit your candidacy for spring campus elections by Thursday, March 30. Open positions include student body president, vice president, and senators; Mr. and Mrs. UTA; UTA Ambassadors; and student service allocation representatives. Apply at the Student Governance Office, Suite B150 in the University Center. LEARN MORE. 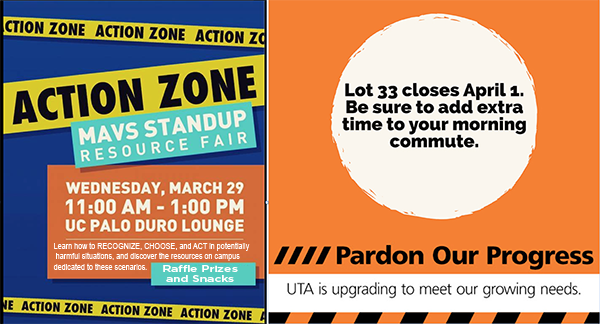 Join fellow students, faculty, and staff for two Mavs on the Town events that include discounted tickets and transportation. 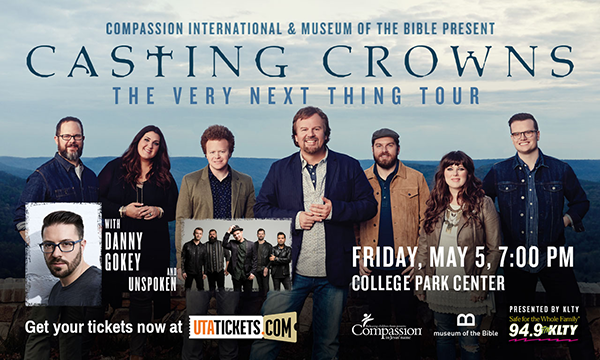 Tickets are available at utatickets.com. 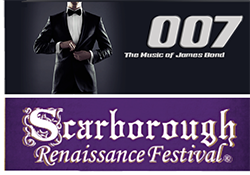 James Bond at the Fort Worth Symphony is at 1 p.m. Sunday, April 2, at the Bass Performance Hall; tickets are $15. Scarborough Renaissance Festival is at 10 a.m. Saturday, April 22, in Waxahachie; tickets are $10. Friday, March 31—Last day to drop classes for spring semester. Monday, April 3—Priority registration opens for summer and fall semesters.